Dan and I both had Friday last week off so we decided to go to Festival Place in Basingstoke and see Hancock. We hadn’t realised, but it was the first weekend of the Hampshire Food Festival. 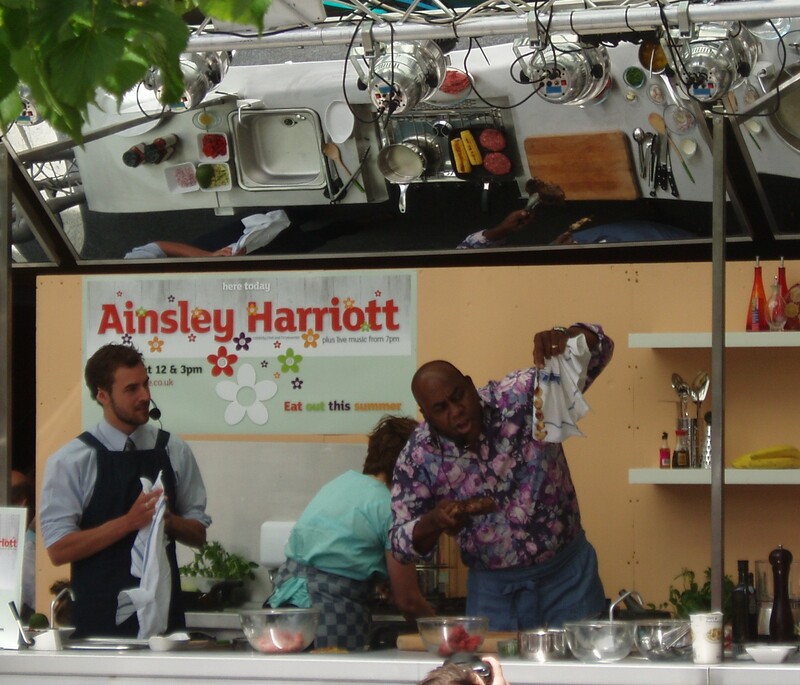 We walked into the square to see stalls of local produce and Ainsley Harriott doing a cooking demonstration. We didn’t watch all of his demonstration, but from where we were, eating lunch in La Tasca, we could hear most of it. It was an energetic show – Ainsley was bounding around the stage doing his thing, and when there was a wait or break in the kitchen activity there was singing along to upbeat music and people in the crowd getting fed. The food festival is going on for the rest of July. Hopefully I’ll be able to make it to a few more of the events. There are quite a few chocolate making workshops that look tempting. Also the Winchester Farmers’ Market might be augmented with additional Festival festivities. 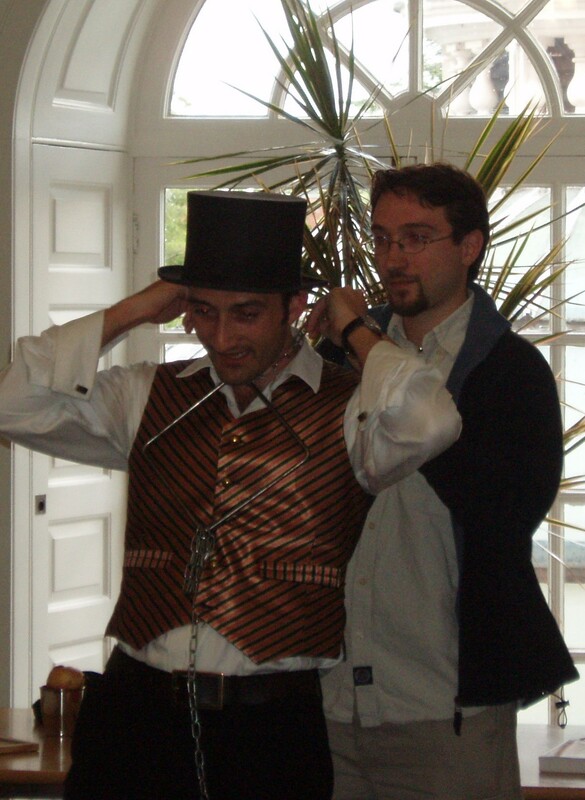 On Saturday IBM were celebrating 50 years at Hursley Park. They celebrated by putting on a bit of a festival in the house and grounds. It was very much a family event with face painting, inflatable fun and parachuting teddybears (courtesy of the Solent Kite Flyers) for the kids. There was quite a bit for the grown-ups too: a few charities had stalls on the lawn, several local businesses were showcasing their wares in the house, and there was dancing in the clubhouse. The highlight of the Hursley 50th was to be a flyby by a Spitfire. The designers of the Spitfire were housed at Hursley Park for part of the war. We had an awesome Spitfire flyby a while back (December 2006) when one of the Spitfire design team passed away – it seemed like the plane was barely skimming the trees that time and some of the loop the loops were almost overhead. Saturday’s flyby was pretty cool, but I didn’t feel quite as much wonder this time. The show was off to one side and the view was blocked by trees from where we were standing, which didn’t help. But I don’t think this pilot was going for it quite as much. Later in the evening there was to be a concert by a Southampton Orchestra, but a turn in the weather and a gap in the programming caused us to adjourn back to Eastleigh for Doctor Who and pub.